While the legislative and executive branches of the Indian government follow a federal structure, the Indian judicial system comprises a unified three-tier structure with the Supreme Court of India (the Supreme Court) holding the position of the apex court. Below the Supreme Court are the High Courts, functioning (in most cases) in each state. Lower in the hierarchy are the subordinate courts, which include courts at district level and other lower courts. Law declared by the Supreme Court is binding on all other courts in India.7 By acceptance of the doctrine of stare decisis, law declared by High Courts binds subordinate courts8 and may have persuasive value over High Courts of other states.9 The Supreme Court and the High Courts are charged with original, appellate and writ jurisdiction. Under the writ jurisdiction they have the power to review administrative action including for the purposes of the enforcement of constitutional and fundamental rights granted under Part III of the Constitution of India. The Arbitration and Conciliation Act 1996 (the Arbitration Act) governs the law related to domestic arbitration, foreign-seated arbitration and enforcement of foreign awards, in India. The Arbitration Act is based on the UNCITRAL Model Law as adopted by the United Nations Commission on International Trade Law on 21 June 1985. Mediation and conciliation have also been given statutory recognition through the Arbitration Act. As a recent trend, even courts often promote alternative dispute resolution. This was discussed in great detail in the case of Afcons Infrastructure Limited v. Cherian Varkey Construction,10 where the Supreme Court laid down guidelines for courts to follow for the effective implementation of Section 89 of the CPC, which encourages parties to settle their disputes by means of alternative dispute resolution. The year 2018 witnessed a series of amendments aimed at introducing greater ease of doing business in India, and at bringing the current law in tune with the rapid economic growth in the country in order to aid foreign direct investments, public private partnerships, public utilities infrastructure developments, etc. One of the primary legislative changes brought about during 2018 are the amendments to the Insolvency and Bankruptcy Code 2016 (IBC), which introduce significant changes on the substantive as well as procedural aspects of the IBC. The IBC, which came into effect on 1 December 2016, is a comprehensive legislation that seeks to replace extant insolvency and restructuring laws in India and proposes to cover corporate persons (i.e., companies and limited liability partnerships), individuals and partnerships. The National Company Law Tribunals (NCLT) have been vested with the jurisdiction in respect of insolvency and restructuring proceedings against corporate persons in India, while the Debt Recovery Tribunal will oversee proceedings against individuals and partnerships. Some of the important amendments to the IBC include the following. Under the IBC, various categories of creditors,11 including foreign creditors, may trigger the insolvency resolution process and provide a single forum to oversee resolution and liquidation proceedings. The recent amendment to the definition of 'financial debt' includes amounts raised from allottees in respect of a real estate project (as defined under the Real Estate (Regulations and Development) Act 2016), thereby recognising their status as financial creditors.12 Homebuyers can now initiate the insolvency process against errant real estate developers and will be entitled to representation on the Committee of Creditors (CoC) of the corporate debtor. Homebuyers will be treated as a class of creditors. Given the large number of homebuyers for a project, they will be represented in the CoC by an authorised representative to be appointed by the National Company Law Tribunal. The IBC provides that the Corporate Insolvency Resolution Process (CIRP) may be initiated on the occurrence of a single payment default of 100,000 rupees and the NCLT will determine whether a payment default has taken place. Accordingly, a CIRP application can be admitted against the corporate debtor.13 The recent amendment14 provides that the law of limitation will apply to IBC applications, removing earlier confusion in this regard. The Ministry of Corporate Affairs (MCA) released a clarification in the past year to the effect that approval of shareholders of the company for any corporate action in the resolution plan (otherwise required under any law) is deemed to have been given on its approval by the NCLT. The IBC is amended to incorporate the clarifications proposed by the MCA. Another significant legislative change brought about in the past year is the recent amendments to the Commercial Courts, Commercial Division and Commercial Appellate Division of High Courts Act 2015, which established special courts governed by procedures tailored for the speedy resolution of commercial disputes. Reducing the ceiling limit from 1 million to 300,000 rupees,26 the recent amendment has increased the pecuniary jurisdiction of commercial courts. In order to reduce the caseload of all commercial cases to be heard by a high court, additional commercial courts,27 based on their pecuniary threshold, have been created below district judge levels for states where high courts do not have original civil jurisdiction, and at the district judge level for states where high courts have ordinary original civil jurisdiction. Appeals from the orders of the commercial courts below district judge level would be filed before commercial appellate courts28 specially created for the purpose. Interestingly, with a view to encourage resolution of commercial disputes by alternate dispute redressal mechanisms, the amendment provides that no commercial suit can be instituted unless the plaintiff exhausts the remedy of pre-institution mediation,29 except in cases where urgent interim relief is contemplated. if the damage caused by the breach could not be determined. However, under the amended law,31 the conditions for the grant of specific performance are better defined. The amendment bars grant of injunction32 in suits involving infrastructure project or contracts where injunctions would delay or hinder the progress of the projects. Special courts33 will be designated for hearing suits in respect of infrastructure project contracts. The amendment posits that disposal of suits within a period of 12 months34 from the service of process are subject to extension for an aggregate period of six months. There were a number of significant judgments of courts in 2018. In Board of Control for Cricket in India v. Kochi Cricket Private Limited,35 the Supreme Court laid to rest the ambiguity that existed around the applicability of the amended provisions of the Indian Arbitration and Conciliation Act 1996 (the Arbitration Act), especially to court proceedings that arise out of an arbitration that commenced before 23 October 2015, the date of commencement of the amendment. Prior to 23 October 2015, mere filing and pendency of an application for setting aside an arbitration award would lead to an automatic stay against its enforcement. The 2015 amendment did away with this provision (under Section 36 of the Arbitration Act), but its applicability on the pending applications for setting aside the arbitral awards caused conflicting decisions by various high courts in India. The Supreme Court has held that amended provisions would apply to pending applications for setting aside the arbitral award. The judgment debtor would now need to specifically seek a stay of the arbitration award or prepare to pay the award notwithstanding the pending challenge to set aside the award. In Union of India v. Hardy Exploration and Production (India) INC,36 the Supreme Court decided on the principle to be applied for determining the seat of an arbitration when the arbitration agreement specifies the venue for holding the arbitration but does not specify the seat. The Supreme Court held that when an arbitration clause only specifies the term 'place' and no other condition is attached to it, it is equivalent to 'seat' and that finalises the issue of jurisdiction. However, if a condition is attached to the term 'place', the same has to be satisfied for the place to become equivalent to seat. In M/s Emkay Global Financial Services Ltd. v. Girdhar Sondhi,37 the Supreme Court has held that an application to set aside an arbitration award are summary proceedings and the courts should ordinarily not allow the parties to lead evidence unless necessary. In Cheran Properties Ltd v. Kasturi and Sons Ltd and Ors,38 the Supreme Court has paved the way for expedient execution of arbitral awards. The Supreme Court held that an arbitral award is capable of being enforced as if it were a decree of the Court, and that to effectuate transfer of shares awarded in arbitration, recourse to the remedy of the rectification of the register was appropriate and necessary. Thus, armed with this decree, a party is entitled to seek rectification of the register by approaching the NCLT under the relevant provisions of the Companies Act 1956. The Supreme Court, relying on the Group of Companies doctrine, further held that since the facts of the present case indicate a mutual agreement by parties (including non-signatories) to be bound by the arbitral award, an arbitral award can be enforced against a third party. In a similar vein, the Division Bench of the Madras High Court in SEI Adhavan Power Private Limited and Ors v. Jinneng Clean Energy Technology Limited and Ors39 set aside an anti-arbitration injunction and stated that the duty of the court is to impart a sense of business efficacy to the commercial understanding reflected in the terms of the agreement between the parties. Applying the Group of Companies Doctrine, the court held that a non-signatory or third party could be subjected to arbitration only in exceptional cases. In addition to factors such as the direct relationship of the party signatory to the arbitration agreement, direct commonality of the subject matter and the agreement between the parties being a composite transaction, the Court would have to examine whether a composite reference of such parties would serve the ends of justice. In Ahmed Abdulla Ahmed Al Ghurair v. Star Health And Allied Insurance Company Limited & Ors,40 the Supreme Court of India held that a derivative action of a foreign company is not maintainable in India and upheld the principle of forum non conveniens while granting leave to a party to institute a suit before the Madras High Court under Clause XII of the Letters Patent Act.41 It further held that if a person holding beneficial interest in shares fails to make necessary declarations under Section 89 of the Companies Act 2013 then neither the beneficial owner nor any person claiming through it can thereafter try to enforce the beneficial interest by seeking declaratory relief from an Indian court. It can be seen in connection with the Indian legal system (as a criticism more than a compliment) that 'there is ample – sometimes excessive – due process; and one has to be patient and persevering'.42 Broadly, court procedure in India is governed by the CPC for civil matters and the CrPC for criminal matters. As discussed above, even where statutes create specialised tribunals and courts to deal with particular disputes, it is sometimes recognised that the principles contained in the CPC and CrPC would continue to apply. This is often so because provisions in the CPC and the CrPC are recognised as the embodiments of the principles of fair play, natural justice and due process. The Commercial Court Act has also set a time of 30 days for the submission of written arguments and 90 days from the date of conclusion of arguments for the pronouncement of a judgment. Appeals have to be disposed of by the appellate body within 60 days from the date of the appeal. In spite of these recent developments to reduce time frames, the time taken for the completion of a trial in civil and criminal proceedings may be several years. In other proceedings, while litigants are typically represented by advocates enrolled under the Advocates Act 1961, there may be exceptions to the rule. For instance, the Family Courts Act57 stipulates that a party may be represented by an advocate only if the court thinks that it is necessary for a fair trial. Further, the Industrial Disputes Act58 restricts the conditions under which a lawyer can appear before the industrial tribunal. The Advocates Act59 empowers a court to permit any person who has not been enrolled as an advocate to appear before it in any particular case. The CPC60 and the CrPC61 contain provisions for service out of the territory of India. India has also entered into bilateral treaties and multilateral conventions for these purposes. Under the CPC, when a defendant resides outside India and no agent in India is empowered to accept service, summons or notice may be sent by courier or post service as approved by the appropriate High Court. This provision must, however, be read together with the procedure prescribed by the Hague Convention on the Service Abroad of Judicial and Extrajudicial Documents in Civil or Commercial Matters 1965 to which India is a party. The CrPC recognises bilateral arrangements and makes compliance with such an arrangement mandatory. It is prescribed that summons or warrants issued by a court in India should be served and executed in accordance with the bilateral arrangement, if any. Also, the Ministry of Home Affairs in India has, by a circular dated 11 February 2009, clarified the procedure to be followed for the issuance of summons to a foreign resident (the MHA Circular). Under the MHA Circular, all requests for service of summons, notices or judicial processes on persons residing abroad shall be addressed to the Under Secretary (Legal) of the Ministry of Home Affairs. Thereafter, the Ministry, after scrutinising the request, can forward it to the relevant foreign officer. A money decree obtained from a court of a jurisdiction notified by the Indian Union government as a reciprocating territory under the CPC can be enforced in India directly by filing an execution petition in a court of competent jurisdiction.62 As a result, judgments of courts not notified as reciprocating territories or decrees other than money decrees cannot be executed directly in India. A decree holder in such a case may file a fresh lawsuit in the Indian courts on the basis of the foreign judgment. In either execution proceedings or fresh suits filed on the basis of foreign judgments, parties may rely on Sections 1363 and 1464 of the CPC. Section 44 of the Arbitration Act prescribes that a foreign award that arises out of (1) an agreement to which the New York Convention on the Recognition and Enforcement of Foreign Awards (the New York Convention) applies and (2) is made in one of the territories in respect of which the Central Government declares that the New York Convention applies on satisfaction that reciprocal provisions are being made, may be enforced in India. In this regard, the Arbitration Amendment Act has clarified that a foreign arbitration award may be set aside if it violates the public policy of India on the same grounds as described for domestic awards above. However, unlike domestic awards, foreign awards cannot be set aside on the ground of patent illegality. Also as discussed above, India is a signatory to the Hague Convention on the Service Abroad of Judicial and Extrajudicial Documents in Civil or Commercial Matters 1965, whose key objective is to improve the organisation of mutual judicial assistance by simplifying and expediting procedures. Rules relating to access to court files may vary depending on the nature of the proceeding, who is seeking access and whether the proceeding is ongoing or concluded. In most cases a person who is a party to the proceeding is allowed to search, inspect or have copies of all pleadings and other documents or records of the case. A third party seeking the information or record may need to apply to the court and show cause to be allowed to do so. the obligation not to disclose information or instructions provided by the client. While there are no specific obligations on lawyers with respect to money laundering, India has a strong legislative framework, including the Prevention of Money Laundering Act 2002, the Income Tax Act 1961, the Foreign Exchange Management Act 1999, the Foreign Contribution Regulation Act 2010 and the Companies Act 2013, that serves to detect and prevent money laundering and the proliferation of the proceeds of crime. Data protection in India is primarily governed by the Information Technology Act 2000 and the Information Technology (Reasonable Security Practices and Procedures and Sensitive Personal Data or Information) Rules 2011 (the IT Rules). These rules define sensitive personal data and information (SPDI)69 and prescribe the manner in which SPDI may be collected, processed, transferred, disclosed or stored. The IT Act provides for damages in the event that the SPDI is not protected and wrongful loss is caused as a result. The introduction of the IT Rules has affected how lawyers may collect and use SPDI. To the extent that SPDI is collected directly from the data subject, the consent of the data subject is required for the purpose of using the SPDI or transfer of SPDI. In the context of due diligence and onward sharing of data with other law firms and LPOs, the levels of compliance appear higher in as much as data sharing agreements usually incorporate the requirements of the IT Rules. However, compliance with the procedures specified in the IT Rules by lawyers generally appear to be relatively lax when it comes to collection and use of data in the course or for the purposes of litigation, especially as damages may be claimed only if wrongful loss can be proved. As discussed above, most provisions of the Companies Act 2013 have been notified. There are certain significant changes with respect to the liability of actors such as directors70 and auditors71 under the Companies Act 2013. For instance, directors of companies facing civil and criminal proceedings are now required to demonstrate that they had 'acted diligently' in connection with the subject matter of the dispute in order for them to be excused from personal liability.72 Under the previous jurisprudence, it was acceptable in some circumstances for non-executive and independent directors to take the defence that they were not involved in the day-to-day operations or management of the company.73 It is likely that this defence will no longer be available. Subject to specified exceptions,74 Section 126 of the Indian Evidence Act, 1872 (the Evidence Act) prohibits an attorney75 from disclosing without his or her client's express consent any communication made to him or her in the course of and for the purpose of his or her employment as an attorney. Recognising the role of interpreters, clerks and other support staff employed by attorneys, the privilege is extended by Section 127 of the Evidence Act to facts coming into their knowledge in the course of their employment. Section 129 protects a client from being compelled to disclose any confidential communication that has taken place with his or her 'legal professional adviser'. As discussed above, an advocate is also prohibited by the BCI Rules from disclosing client communications or advice given by him or her to the client. Apart from the Arbitration Act, the Supreme Court of India in Salem Bar Association v. Union of India82 recommended the adoption of arbitral rules that were formulated by the Jagannadha Rao Committee. The draft rules made by the Committee were circulated to all the High Courts. The rules provide for the procedure according to which the referral to ADR mechanisms under Section 89 of the CPC can take place, including the stage at which the referral can take place. Guidelines to be observed by the court before making such referral have also been set out. the Recognition and Enforcement of Foreign Arbitral Awards 1958 (the New York Convention). The Arbitration Act is applicable both to domestic and foreign-seated arbitrations. 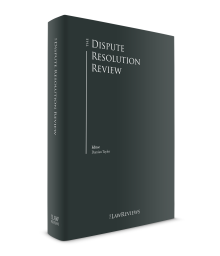 Part I covers the scope of domestic arbitrations, whereas Part II covers foreign-seated arbitrations and the enforcement of foreign awards. Part I defines the scope of what constitutes arbitration,83 the essentials of an arbitration agreement84 and the procedure for determining the validity of such an agreement.85 It is important to note in this regard that there are limited instances and time-bound procedures for challenging the validity of such an agreement and the arbitral tribunal has the power to determine its jurisdiction. Section 5 of the Arbitration Act specifically provides, with respect to Part I, that no judicial authority may intervene in arbitration except in a case where a stipulation to this effect has been made. The initial years of the implementation of the Arbitration Act saw regressive interpretation that allowed frequent and wide-sweeping judicial intervention from Indian courts. The judgments of the Supreme Court and High Courts have, however, broken the trend and are serving to restore confidence in India as a potential arbitration destination. The Arbitration and Conciliation (Amendment) Act 2015 has also introduced various provisions that promote arbitration by reducing the timelines and costs involved. Further, although statistically there are more ad hoc arbitrations conducted in India, the use of institutional arbitration is growing gradually. This has to do in part with the reputed arbitration institutions, such as the Singapore International Arbitration Centre, setting up establishments in India. India's first international arbitration centre, the Mumbai Centre for International Arbitration, was set up in Mumbai in 2016. The High Courts at Delhi, Karnataka, Punjab and Haryana, and Madras, inter alia, have set up arbitration centres with the objective of providing recourse to credible yet affordable arbitration. The most important component of mediation is that it is the parties to the dispute who decide the terms of settlement. In conciliation on the other hand, the conciliator makes proposals, and formulates and reformulates the terms of settlement. Mediation was first given statutory recognition in the Industrial Disputes Act 1947, where officers appointed under Section 4 of the Act are 'charged with the duty of mediating in and promoting the settlement of industrial disputes'. Mediation, as a form of dispute resolution has not obtained independent force in India but is mostly institutionally annexed to the courts through Section 89 of the Code of Civil Procedure Code 1809. To that extent, this might compromise the independence of mediations from court-related procedures and interference. Nevertheless, it gives mediations greater legitimacy and compatibility with the formal dispute resolution processes in society. Another point to be noted is the growing importance of mediation clauses in commercial agreements. Both mediation and consultation form a mandatory aspect of pre-arbitration procedure. It has also been held by courts that mediation and consultation are a substantial part of the agreement and are to be followed prior to any arbitration being initiated.86 In the event that the dispute is referred first to arbitration, the tribunal has the power to render the petition inadmissible on the grounds of the pre-arbitration procedure prescribed by the agreement being violated by the parties. Akin to the Arbitration Rules 2006, the judges of the Salem bench also recommended the adoption of the Civil Procedure Mediation Rules 2006. These rules govern almost the whole of the mediation process starting from the procedure for appointment of the mediator by both the parties from a panel of mediators who have already been formed for this purpose by the district courts. The qualifications and disqualifications for the panel, the venue of the mediation, the removal of a mediator from the panel, their impartiality and independence, the procedures during the mediation itself, confidentiality, privacy, the settlement agreement and many other aspects are governed by these rules. It is pertinent to note also the popularity of court-annexed mediation whereby mediation centres have been set up by various High Courts including in Delhi, Madras and Bangalore. In India, the judge-to-population ratio is not adequate to meet the huge volume of litigation, effectively adding to the delay in redressal. This phenomenon is often referred to as the 'docket explosion'. Considering the extensive legal framework and significant backlog of litigation, Indian arbitration has made strong attempts to bring about a dynamic change. However, the ordinances, especially if enacted by Parliament, are expected to reduce many difficulties with regard to timing, cost, finality of awards and interim reliefs faced by both foreign and Indian parties wishing to arbitrate in India. In a practical scenario, a foreign investor will have the ability to approach a court for protective relief with respect to Indian shares and Indian assets and for other support, such as the recording of evidence in India. On the other hand, the ability to apply to an Indian court for annulment of an award may not be beneficial in all cases. Indian courts in exercise of jurisdiction under Section 34 of the Arbitration Act have previously taken an expansive interpretation of the grounds for challenge of an award. While the Arbitration Amendment Act has attempted to narrow the scope of interpretation around the term 'public policy', this remains untested in Indian courts. Therefore, it is possible that an Indian arbitral award may be re-litigated in an Indian court. Unlike the previous regime, where parties to arbitrations seated outside India did not have recourse to Indian courts under Part I of the Arbitration Act, the Arbitration Amendment Act extends certain provisions of Part I (discussed above) to foreign-seated arbitrations, subject to an agreement to the contrary. This amendment may therefore enable a foreign investor who thinks an Indian party may dissipate its assets or transfer or devalue Indian shares, to approach an Indian court for interim relief. Therefore, even if the Indian party does not have a presence or assets at the foreign location where the arbitration is seated, given the extension of certain provisions of Part I of the Arbitration Act by the Arbitration Amendment Act, foreign investors may be able to obtain protective orders in India. This reduces the risks attached to waiting until an award is finally pronounced by the tribunal. In this regard, an award of a foreign tribunal, if required to be enforced in India, would need to be presented for enforcement under Section 48 of the Arbitration Act. An Indian court can review the foreign award to the limited extent provided under Section 48 of the Arbitration Act to examine whether it may be enforced. As stated above, since the definition of 'court' under the Arbitration Act has been amended to mean the jurisdictional High Court for international commercial arbitrations, the proceedings for enforcement of foreign arbitral awards will now lie before the High Court. Additionally, if the subject matter of the dispute resulting in the foreign award is in excess of the 'specified value' as defined under the Commercial Courts Act, all such matters will be heard and disposed of by the commercial appellate division of that High Court. The impact of judicial precedents on the arbitration regime in India remains, however, to be seen. It may be too soon to ascertain the prospects for a young country such as India. 1 Zia Mody is the founder and managing partner and Aditya Vikram Bhat is a partner at AZB & Partners. The authors would like to acknowledge Priyanka Shetty, who is a senior associate and Jomol Joy, who is an associate at AZB & Partners for their assistance. 2 Glanville Williams, Learning the Law (Sweet & Maxwell, 1982) p. 19; Law Commission of India, 54th Report, p. 8. 3 Bharat Barrel and Drum Manufacturing Company Private Limited v. Employees State Insurance Corporation AIR 1972 SC 1935. 4 Section 2(c) of the Commercial Courts Act. 5 Sections 3, 4 and 2(i) of the Commercial Courts Act. 6 See e.g., Groz Beckert Sabool Ltd v. Jupiter General Insurance Co Ltd and Ors AIR 1965 P&H 477 and Sri Ramdas Motor Transport Limited v. Karedla Suryanarayana 110 ComCas 193 (Andhra Pradesh). 7 Article 141 of the Constitution of India. 8 Baradakanta Misra v. Bhimsen Dixit (1973) 1 SCC 446. 9 Pradip J Mehta v. CIT (2008) 14 SCC 283. 10 (2010) 8 SCC 24. 11 Sections 7 and 9 of the IBC. 12 Inserted by the Insolvency and Bankruptcy (Second Amendment) Act 2018 as Section 6A of the IBC. 13 Sections 7 and 9 of the IBC. 14 Inserted by the Insolvency and Bankruptcy (Second Amendment) Act 2018 as Section 238A of the IBC. 15 Section 14 of the IBC. 16 Section 13 of the IBC. 17 Section 14 of the IBC amended by the Insolvency and Bankruptcy (Second Amendment) Act 2018. 18 State Bank of India v. Ramakrishnan Civil Appeal No. 3595/2018. 19 (2018) 1 SCC 40. 20 Section 60(5) of the IBC. 21 Section 12A of the IBC inserted by the Insolvency and Bankruptcy (Second Amendment) Act 2018. 22 Amended by the Insolvency and Bankruptcy (Second Amendment) Act 2018. 23 Section 29A of the IBC inserted by the Insolvency and Bankruptcy (Second Amendment) Act 2018. 24 Section 10 of the IBC amended by the Insolvency and Bankruptcy (Second Amendment) Act 2018. 25 Section 21 of the IBC amended by the Insolvency and Bankruptcy (Second Amendment) Act 2018. 26 Section 3 of the principal Act was amended by the Commercial Courts, Commercial Division and Commercial Appellate Division of High Courts (Amendment) Act 2018. 28 Section 3A to the principal Act inserted by the Commercial Courts, Commercial Division and Commercial Appellate Division of High Courts (Amendment) Act 2018. 29 Section 12A to the principal Act inserted by the Commercial Courts, Commercial Division and Commercial Appellate Division of High Courts (Amendment) Act 2018. 30 Section 10 of the Specific Relief Act 1963. 31 Section 10 is amended by the Specific Relief (Amendment) Act 2018. 32 Section 20A inserted in the principal Act by the Specific Relief (Amendment) Act 2018. 33 Section 20B inserted in the principal Act by the Specific Relief (Amendment) Act 2018. 34 Section 20C inserted in the principal Act by the Specific Relief (Amendment) Act 2018. 35 (2018) 6 SCC 287. 37 2018 (10) SCALE 15. 38 2018 SCC OnLine (SC) 431. 39 Original Side Appeal Nos.170 to 175 and 206 to 210 of 2018. 40 2018 (15) SCALE 133. 41 Clause XII of the Letters Patent of the High Court of Madras sets the limits of the original jurisdiction of the Court. Except for certain suits, the High Court of Madras has jurisdiction to entertain suits where, inter alia, part of the cause of action has arisen within its territorial limits. However, for this purpose, the leave of the Court has to be first obtained. 42 Fali S Nariman, 'India and International Arbitration', 41 Geo Wash Intl L Rev 367. 43 Schedule I to the Limitation Act 1963. 44 For instance, the Consumer Protection Act 1986 sets out a period of limitation of two years from the date when the cause of action arose for filing a complaint. Or, for instance, under the Arbitration Act an application for setting aside a final award can be made within three months from the date of the award. A court at its discretion taking on record reasons for delay can grant an extension of 30 days. 45 Power Control Appliances v. Sumeet Machines Limited (1994) 2 SCC 448. 46 AP Steel RE Rolling Mill v. State of Kerala (2007) 2 SCC 725. 47 Order VIII, Rule 1 of the CPC. 48 Order VI, Rule 17 of the CPC. 49 Order VII, Rule 14 of the CPC; Order XII Rule 2 of the CPC. 50 Section 15 of the Arbitration Amendment Act. 51 Section 5 of the Arbitration Amendment Act. 52 Section 12 of the IBC. 53 Order I, Rule 8 of the CPC. 54 Section 241 read with Section 244 and Section 245 of the Companies Act 2013. Sections 397, 398 and 399 of the Companies Act 1956. 55 People's Union for Democratic Rights v. Union of India 1983 SCR (1) 456. 56 Article 22 of the Constitution of India. 57 Section 13 of the Family Courts Act 1984. 58 Section 36 of the Industrial Disputes Act 1947. 59 Section 32 of the Advocates Act 1961. 60 Order V, Rule 25 of the CPC. 61 Section 105 of the CrPC. 62 Section 44A of the CPC. A foreign judgment shall be conclusive as to any matter thereby directly adjudicated upon between the same parties or between parties under whom they or any of them claim litigating under the same title except (a) where it has not been pronounced by a Court of competent jurisdiction; (b) where it has not been given on the merits of the case; (c) where it appears on the face of the proceedings to be founded on an incorrect view of international law or a refusal to recognise the law of India in cases in which such law is applicable; (d) where the proceedings in which the judgment was obtained are opposed to natural justice; (e) where it has been obtained by fraud; (f) where it sustains a claim founded on a breach of any law in force in India. 65 Section 2(5) of the CPC defines a 'foreign court' as a court situated outside India and not established or continued by the authority of the central government. 66 Section 29 of the CPC. 67 Intertoll Ics Cecons O & M Co Private Limited v. National Highways Authority of India 129 (2006) DLT 146. 68 Re KL Gauba AIR 1954 Bom 478; In Re: Mr 'G', A Senior Advocate of The Supreme Court AIR 1954 SC 557. 69 The 'sensitive personal data or information' is defined in the IT Rules as personal information that consists of (1) the password; (2) financial information such as bank account, debit or credit card; (3) physical, psychological and mental health condition; (4) sexual orientation; (5) medical records and history; (6) biometric information; (7) any detail relating to the above as provided to the body corporate for providing a service; or (8) any of the information received under each of the heads by the body corporate for processing, or to be stored or processed under a lawful contract. 70 See, for instance, Section 2(60), which includes directors within the definition of 'officers in default'. Section 166 also lays down duties of directors, which if contravened would result in penal consequences in the form of fines. Section 42(10) stipulates that contravention of the procedure of private placement would impose liability on the directors of the company for a penalty up to 20 million rupees or the amount involved in the offer, whichever is higher. In general, the penal provisions are Sections 447 to 457 of the Companies Act 2013. 71 See, for instance, Section 140, which empowers NCLT to suo moto or on an application, if it is satisfied that an auditor has acted in a fraudulent manner, direct a company to change its auditor. Such auditor will also be liable to penal action under Section 447. Section 147 also penalises auditors for contravention of duties of auditors and auditing standards as set out under the Companies Act 2013. Separately, Section 247 of the Companies Act 2013 imposes penalties on a valuer who has not exercised adequate due diligence. 72 Section 166(3) imposes a specific duty on a director to exercise his or her duties, inter alia, with due and reasonable care. Separately, however, Section 463(1) empowers the court to grant relief if the director has acted honestly and reasonably. 73 Section 149 read with Schedule IV provides for a code of conduct to be followed by independent directors. Specifically, Section 149(12) imposes a liability of independent directors in respect of actions or omissions that had occurred through his or her knowledge or where he or she had not acted diligently. 74 There are two statutory exceptions to the rule of client–attorney privilege. First, any communication made in furtherance of any illegal purpose is not protected and second, facts observed by the attorney in the course of his or her employment, showing that any crime or fraud has been committed since the commencement of his or her employment, are not protected. 75 The Evidence Act predates the Advocates Act 1961. The expressions 'barrister', 'attorney', 'pleader' or 'vakil' refer to various categories of legal practitioners recognised when the Evidence Act was enacted. The Advocates Act 1961 now recognises a single category of legal practitioner qualified to practise law, and defines them as 'advocates'. 76 AIR 1982 Bom 6. 77 (2003) 114 CompCas 141 (Bom). 78 (2001) 2 SCC 365. 79 Section 162 of the Indian Evidence Act 1872. 80 See, for instance, the judgment of the Bombay High Court in Larsen & Toubro Limited v. Prime Displays Private Limited (2003) 114 CompCas 141 (Bom). 81 Afcons Infrastructure Limited v. Cherian Varkey Construction (2010) 8 SCC 24. 82 AIR 2005 SC 3353. 83 Section 2(1)(f) of the Arbitration Act. 84 Section 7 of the Arbitration Act. 85 Section 16 of the Arbitration Act. 86 Thermax Limited v. Arasmeta 2008 (1) ALT 788. 87 Section 62 of the Arbitration Act. 88 Section 63 of the Arbitration Act. 89 Section 64(2) of the Arbitration Act. 90 Sections 73 and 74 of the Arbitration Act.